Showing 14 articles from March 16, 2015. 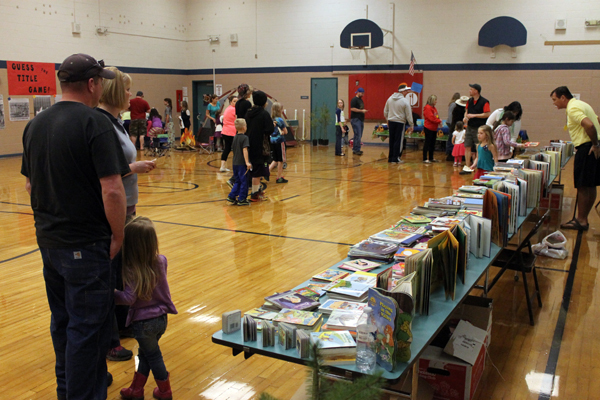 Volunteers with Toledo Elementary School's Parent Teacher Organization (PTO) were pleased to see an increase in participation during their second annual Family Reading Night last Thursday. Despite a sunny evening drawing many families out of town, PTO President Semra Stanley said her group took this year to learn lessons from last spring's event, as well as develop more in-depth activities for the wide range of age groups attending. The next Ryderwood Town-Wide Garage Sale will be the end of next month, April 24 & 25. With so many new households, there should be a larger selection than ever. (Many will have brought too much or not enough when they moved...) It is a great opportunity to "re-home" some things that are no longer needed or desired. For those not wishing to host their own, goods can be donated to the Women's Club for their big sale. The town's veterans' groups (we have both AMVETs and VFW Posts!) will host lunch in Community Hall. March 19 Toledo School Board meets 7 p.m. third Thursdays at Middle School library. Visit http://www.toledo.k12.wa.us/ or call (360) 864-6325. The Park Board is looking for volunteers to help with upcoming projects, including the installation of railroad-themed decorations and a fence at Werden Park. For more information, including how to help, call Board Chair Steve Krohn at (360) 880-6281. The Park Board has also announced a decision to re-open McMurphy Park in light of improvements in the weather, though the park may be closed temporarily in the event of heavy rain or storms. Time remains to sign up for the CPR/First Aid class offered at City Hall. The class is scheduled for March 28 from 9 a.m. to 1 p.m. and the cost is $50, and comes with a three-year certificate of completion from the American Heart Association. Be sure to sign up beforehand, and call City Hall at (360) 295-3222 for more information. 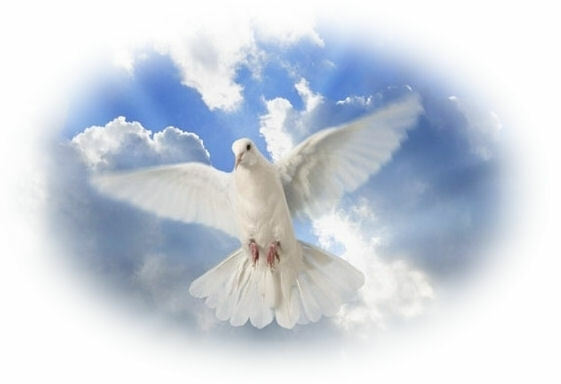 Long-time Toledo resident Bert Oberg passed away March 12, 2015, at the age of 87. He was born in Toledo, Wash., on April 22, 1927, to Swedish immigrants Helmer and Mary Oberg. 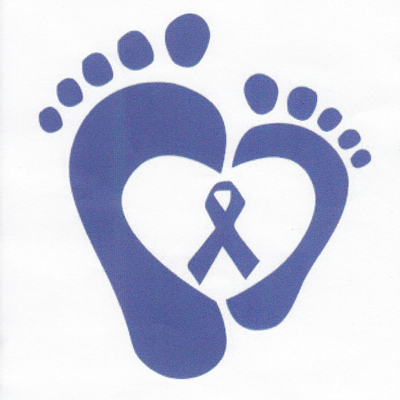 The Vader City Council has passed a motion declaring April as Child Abuse Awareness Month, with plans being developed to create a related memorial in the near future at a city park. Approved during the council's March 12 meeting, the motion had been suggested by local resident Ruth Crear, who works often with abuse victims as an advocate for foster children in Lewis County, and has personally been impacted by the affects of child abuse. 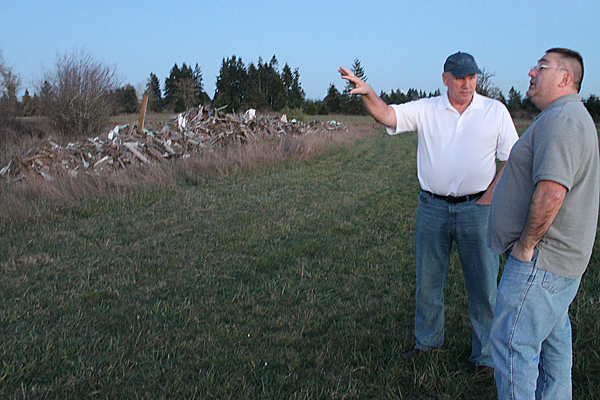 A large debris pile at a planned subdivision on the edge of Winlock continues to be a source of concern for city officials, who have begun discussing legal remedies and are hoping to avoid a costly outcome. During the March 9 meeting of the Winlock City Council, officials said they feel their approach needs to be more proactive in compelling property owner Phil Smith to remove the debris, as efforts so far by Lewis County's Department of Health and Social Services have yet to see the matter resolved. The verdict is in. Forrest Wallace is taking his talents to the track. Wallace is a senior student athlete at Toledo High School with multiple talents and special athletic abilities. Last spring, he turned out for soccer and was a major contributor to the Toledo/Winlock soccer team, who ended the season a win away from state competition. This year he considered going out for baseball, but eventually settled on Track & Field. Authorities are seeking help solving a theft taking place earlier this month in the Salkum area. Sometime between March 5 and 6, an unknown number of suspects entered a rock quarry on the 200 block of Winston Creek Rd., east of Salkum, and stole more than 1,200 feet of electrical wire and a 1995 box van. The van was later recovered, but the wire was not. The estimated loss is more than $20,000. Local fire and EMS calls between March 9 and 15. A Toledo woman has been killed in a collision on I-5 Thursday, according to the Washington State Patrol. Nadine A. Beaman, 52, had been traveling north on I-5 riding a 2013 Harley Davidson SLD103 near Milepost 53 when a 2007 Ford Mustang driven by a 55-year-old Ocean Shores woman struck debris in the roadway and lost control, striking Beaman and causing her to strike the Jersey barrier and become ejected into the southbound shoulder. The Lewis County Sheriff's Office is cautioning residents against phone scams being perpetrated in the area involving individuals posing as the IRS. Deputies have received several reports of random calls by "very aggressive" persons with "strong foreign accent/dialects" claiming to be from the IRS and demanding personal information. 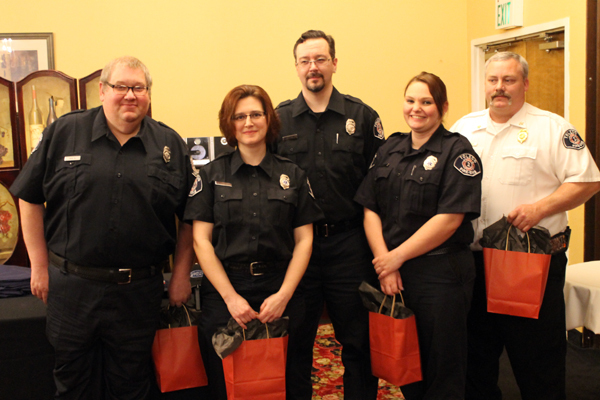 Members of Toledo's Lewis County Fire District 2 celebrated the accomplishments of their staff and volunteers during their annual awards dinner Saturday at Parker's Steak House. Among those recognized were the top responders for 2014, who each responded to more than 100 out of the 393 calls received last year.